awww, what a great idea. she is too cute! hope she has a wonderful first birthday! Happy first birthday for Eleanor once again!!! She’s totally sweet!!! happy birthday… to you all! you made it through the first year!!! I cannot believe she is already a year old…crazy. I can’t believe it’s already been a year! Wild. She’s so adorable. Congratulations. You survived the first one. Love her little toothy grin, Happy Birthday Eleanor!!! Happy birthday Eleanor! What a beauty. I can’t believe it’s been a year! That girl is just so gorgeous! Happy birthday, Eleanor! WOW??!!! A year – already? I remember reading what seems like yesterday and thinking that baby must be due soon, and then the post when she was born. Each month that you post her photo, I can’t believe it’s that time again already. Now a YEAR? Unbelievable. Happy Birthday Miss Eleanor! Happy Birthday, Eleanor! Wow – the year has flown by! Oh my. Where has the time gone. Happy Birthday Eleanor. Happy Birthday Eleanor! You are so well loved! I love the toes being pointed! So precious! OMGoodness! How did a year pass already! Time REALLY gets away from you, huh? She’s lovely, Nicole! So happy and lovely! What more could you want!? Happy Birthday, Eleanor! Time passes so very quickly. It seems like just yesterday I was reading about Eleanor’s birth (and about the porch you painted at 9 months pregnant)! Happy Birthday to the little one! I have to say, this is such a great idea. It makes it easier to see her growth with it being the same background. Very cool. She’s beautiful. Look at that sassy baby! Happy birthday! Happy Birthday from Australia. Your body is growing to catch up with your head! Happy Birthday to the blogfamous baby! Time for a sister/brother??? This is a lovely thing to do. The photos are all beautiful. It seems impossible she’s already one! so sweet! happy bday eleanor! Oh my goodness. Now she’s rocking! I can’t beleiee it’s been a whole year. Happy Birthday cutie pie! Happy Birthday to your precious little girl! :) She’s so beautiful! When did she get the teeth?! They are adorable. I am still waiting to see when my son (11 mos) gets his… They make them look so grown up! Well, that sure went by fast! Happy Birthday, Eleanor. what a cutie! congrats on your first year of mommy-hood. One year is passed already!?!! How lovely she is. Also – I think I fall in love with your curtains more every month. Hmm. Delightful pic. Congratulations to you both! Happy Belated Birthday, Eleanor! Hope you had a great one. YEAH!!! Happy Day Missy Eleanor!!!!! She is the cutest little bean ever, and I have loved seeing her monthly photos. Happies of birthdays to her! Happy First Birthday! Will you be posting birthday party pics? It’s amazing how much they grow in the first year isn’t it? Too sweet and I can’t believe how fast it’s gone by. Sweet baby dreams to you, E! Aww what a cutie! Happy 1st birthday to Eleanor! a year flew by. she’s a cutie. thanks for all you share! Awe…what a sweetie! Happy Birthday Eleanor!!! I feel like you should continue this every month til she graduates from high school…it’s just such a cute idea! Happy birthday Eleanor! I have twin boys who are about a month older, but we had the same due date of April 20. I remember when you announced your pregnancy, and it’s been fun going through all the stages with you guys! Somehow I can’t believe Eleanore is already one, it makes this last year seem much shorter than it felt, if you know what I mean. Anyhow, congratulations, and I look forward to experiencing toddlerhood with you! Happy birthday! I can’t believe it’s already been a year. Amazing how fast time flies by. She is lovely. COngratulations!!! Happy Birthday! Your baby and your blog are fabulous! Greetings from Spain. Happy Birthday beautiful,sweet Eleanor!!!! I hope all your birthday wishes come true! What a clever idea! She’ll be so happy to have those photos when she’s older. Awww! I know we’ve been seeing her every month, but this is the first time my reaction was “Look how big she’s gotten!” Really, she has. She looks so grown up! Happy Birthday Eleanor! happy birthday sweetheart!! !many hugs from Mexico!!! She definitely is picture perfect and postcard ready… congrats on the gorgeous child! how can she possibly be a year old already?! 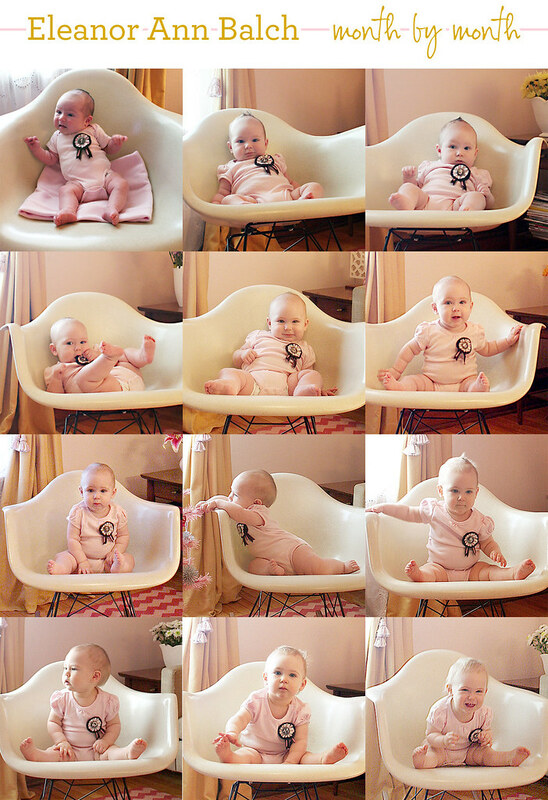 I have been reading your blog since before she was born, I remember the very first chair picture when it was posted… it can’t possibly have been a year already! time certainly flies! Happy birthday gorgeous girl! Look how much she’s grown. Happy Birthday to the little girl!!! Wow! I a year has already passed. Happy Birthday Eleanor! Wow, she has changed *a lot* in the last month. She has more… defining(?) features now. Maybe it’s just the expression she’s making. Thanks for sharing this project with us. It’s going to be such a treasure for your family! I can’t wait to see how she develops over the next twelve pics. I have absolutely loved these photos since the beginning (I might even call my husband over and make him look every single time)! Hope Eleanor had a phenomenal first birthday! Look how much she has grown! Too cute…. I totally plan on stealing this idea when I have kids. Congrats Nicole for your first year as a Mom!!!! This is the cutest idea! Thanks for sharing. Completely inspiring… she is adorable! Do you have that pink onsie in every size, or do you make them? So cute as always! Happy belated birthday to your little one. Just started reading your blog about a week ago, and it is wonderful! Definitely making note of things I’d like to do once I (we, rather – avec future hubby) have a place. A very happy birthday to little Eleanor – she is totally adorable! What a cutie! And what a fantastic idea! Happy Birthday to your sweet Eleanor! I love the pictures, they grow so fast. Our little one just turned 4! We have a little photo album that was given to us that holds one picture for each year. The idea is to have the baby wear the same outfit with meaning for each year. We put her in my wedding dress…it will be cool when she is standing there in it. Now she sits on the couch with the dress draping down. Adorable! So neat how her hair went blond. See what happens when I don’t visit for awhile!!! She’s such a big girl and full of personality. You can tell from the picture. Happy 1st sweetie!!! this is amazing… so perfect and ur daughter’s pose at each month actually captures the development growth at that stage. love the one where she is crawling out and leaning forward! Would make a brilliant book! You should continue to photograph her in that same chair yearly! till she leaves home! and publish it in a book in the end…could even have her child in the same chair one day! 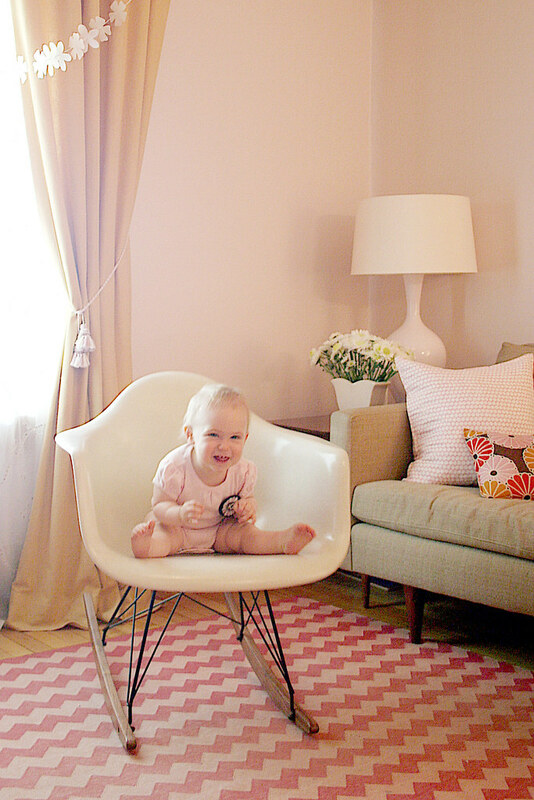 » Eighteen Months Old (Eleanor’s Monthly Photo) Making it Lovely | Transforming the so-so. This series is wonderful. my husband and I always talk about doing this and never do. We’re thinking of setting up a photo station in our new home (which is why I am perusing your blog). wow, how she has grown! ad such a cute remembrance of her! uooooohh!! it’s so sweet, i love it!